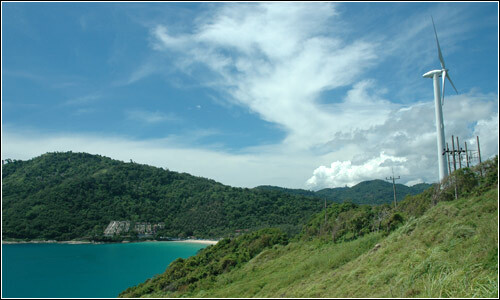 Promthep Cape is the most famous cape in Phuket, as it is the best location to watch the beautiful sunset in breathtaking scenery. Promthep Cape is found at the southern most tip of Phuket Island, and from the viewpoint you can admire the sunset without trees or hills obscuring your view. 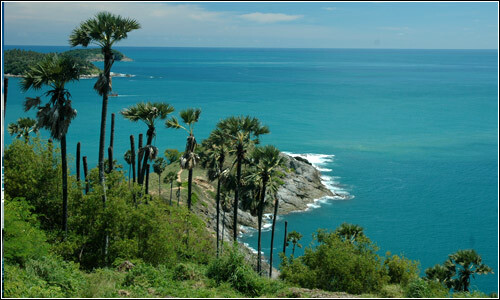 Outside of the beautiful sunsets, Promthep Cape is a top scenic spot and top photo opportunity during the daytime. The view in every direction from the point has something different to offer. To the east is Rawai Beach and various islands including, if the weather is clear, Koh Pee Pee. To the west you can see Coral Island, Loan Island and the huge expanse of the open ocean. To the North, you can see the coastal road that will take you to Nui Beach and the charming Nai Harn beach with its beautiful white sand. If you really want to see the sunset in full glory, you’d better be quick, because you will need to claim your place before the sun hits the water. If you come late, you may have problems finding a space to park or even a place to stand, especially during a festival, as there can be many, many people. If you’re a photographer, and you want a picture of the sun setting behind the cape, then it is recommended that you go to the Promthep Temple. You can find the entrance on the road leading from Rawai, 500m before you reach the parking lot for Promthep Cape. From here, you can get a clear shot of the headland, with the sun setting behind, a shot that most people do not get. In addition, you don’t need to fight with the crowds of tourists who usually go to the cape itself.